Hello! Thank you for stopping by! It's time for the Annual Anything Goes challenge at Tuesday Morning Sketches. Be sure to visit the blog to get the low down on the challenge and see what everyone made to share with you. Cards, wall art and a hand painted card! My project features my very small, very minimal attempt at mixed media. I cannot let myself and really try this out. 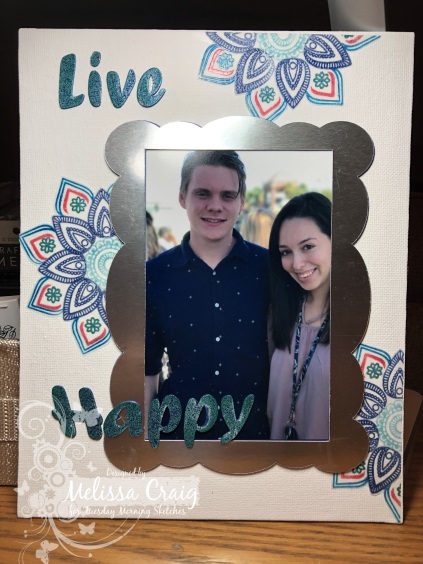 But my daughter will love it - it's her favorite picture of her and her boyfriend. The canvas is 8 x 10 and I gesso'd it first. Using the Mandala Maker stamp set by Gina K, I stamped out the mandalas on vellum with die inks from Simon Says Stamp and MFT. Because it's on vellum the ink stays wet so I able to emboss each layer, no not right, round of the mandala. I then cut them out and glued them to the canvas. Using my Silhouette I cut the frame out of a few pieces of card stock and then the silver foil paper and glued all them together. 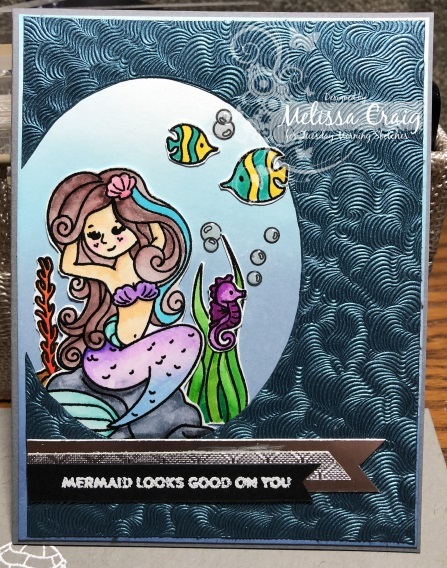 I also cut out the letters and covered them with embossing ink and then added Mermaid Blue embossing powder. I truly wanted to add so much more - I want to do mixed media with reckless abandon but I just can't take myself over that edge. I wanted to stencil some embossing paste onto the canvas. I wanted to add embellishments but in the end I made a hard scrapbook page that still needs so much more. You have until December 30th to play along and Tuesday Morning Sketches will resume challenges on January 8th. Wishing you and your family a very Merry Christmas or whatever holiday is special to you and your family. And in all of our cultural differences, we have one in common - Happy New Year! I hope 2019 will be a blessing to you. Thank you for stopping by! I do appreciate your visit and your comments. The very last sketch of 2018 is up at Tuesday Morning Sketches and it's a fun one. My card this week is a pretty loose interpretation of the sketch - but we all have to take some creative license some time. 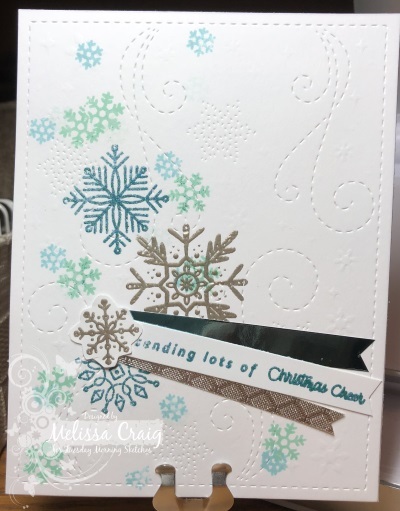 My card features December Simon Says Stamp card kit, a cover plate die from Kat Scrappiness some beautiful embossing powders from Simon Says Stamp and WOW! Ink colors from Simon Says Stamp and MFT Stamps. 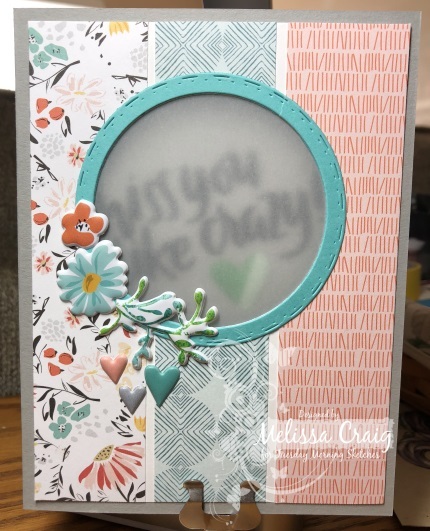 There's a couple of scraps of paper that I've featured before from a past card kit from Spellbinders. Just look at that shine! The embossing powders are Metallic Platinum from WOW! 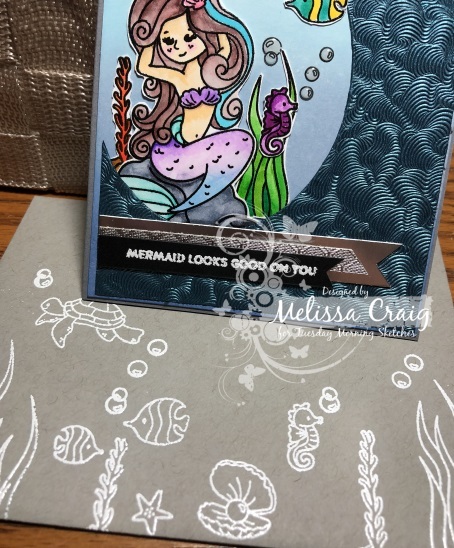 and Ultra Fine Mermaid from Simon Says Stamp. The sentiment is actually 2 different ones. "Sending Lots of" is from Beautiful Flowers (SSS) and December kit Christmas Cheer (SSS). Thanks for stopping by and I hope to see you at Tuesday Morning Sketches. Hello! Thank you so much for stopping by. The latest sketch is up at Tuesday Morning Sketches and it's a fun one. It's simple with some easy elements and it's very flexible - it can be whimsical or it can be elegant. It can be anything you want it to be. My card features some great products that I scored from Pink and Main during their Black Friday sale. I've had my eye on this die since Michelle released it last month. This is the Eyelet Cover plate and isn't it great!! I love it. I cannot wait to play more with it, I have some ideas running around my head. The sentiment is also from Pink and Main, it's from a set called Believe Script (pssst - it's on sale for $9). I cut the cover plate die and just layered the white on white. I then pulled out some scraps that I've had left over from one of the Spellbinder's card kits I bought months ago. These colors give a nice winter feel without it being that theme. I was going to two lace flowers but I dropped one and the puppy picked it up and chewed it to shreds. I also had been playing with the die so I had this cut piece sitting on my desk. I used it to blend on some Fog ink by Simon. Just look at the shine from the paper and that eyelet design! I love how this turned out. I'm glad this turned out well because I didn't have the best weekend. In fact, I whined the entire weekend (the only ones that heard me was the dogs and they didn't care). I still don't have my Simon Says Stamp December kit and I still don't have the other two orders that I placed during some great Black Friday/Cyber Monday sales. One package was supposed to be here Thursday and the other Saturday. What's really frustrating is I don't even know where my stuff is! Tracking just says "your package will deliver later than expected but it's still on the way!" Like that's what I want to hear. Okay, I'm whining again. I'm sorry. 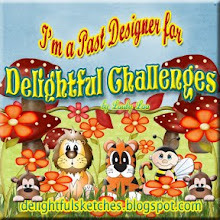 Please join us at the Tuesday Morning Sketches blog for this week's challenge. Hi there! Thank you for stopping by. The latest sketch is up at Tuesday Morning Sketches and it's a fun one. Super easy elements. I have to say I struggled a little and not really from the sketch, but because I had an idea in mind to stamp scene with the newest Simon Says Stamp kit, but I don't have it yet. And you know when you get an idea stuck in your head, it's hard to see past it. 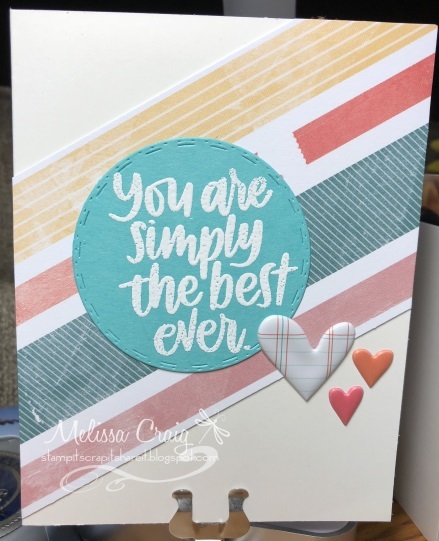 So this card features papers and sentiment stamps from a previous kits. So I went to JoAnn's on Saturday with my daughter. I was looking for new papers to make my 2019 planner. They had paperstacks on sale at 70% off! I found one that I liked and paid $4.49 for it! Well she found this card stock that is their store brand, Park Lane, that is marbled looking. This pack of card stock was on sale for 50% off so I think I paid $2.99 for it - something like that. It's actually very nice card stock. It's a great weight for bases. It feels heavier than 80 lb card stock but not quite as heavy as 110 lb. I thought it paired nicely with the watercolor design of this paper by Moda Scraps. I matted it with some gray card stock that I also used for the sentiment strip. 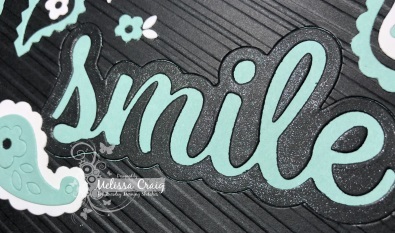 The sentiment is heat embossed using some SSS navy blue embossing powder. Flipped and a little more creative license with the sketch I made this modern type Christmas card. I used the Retro Petals Turnabout stamp by Concord and 9th. 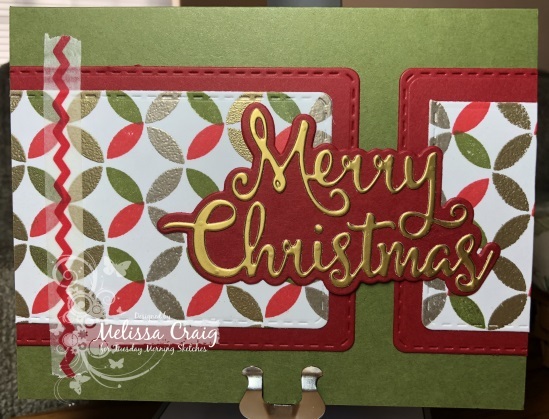 I used two ink colors from MFT and then heat embossed with gold and platinum embossing powders. The Merry Christmas sentiment and the stitched rectangles are dies from Pink and Main. I cut the sentiment out of gold foil paper that came in a previous SSS stamp kit. Slapped on a strip of washi. This card was easy to put together, in fact I made two! I hope to see you over at the TMS blog. The design team created some beautiful cards to share! Thank you so much for stopping by. The latest sketch is up at Tuesday Morning Sketches and it's a great one by Debbie. And although Debbie created the sketch my sister Karin certainly inspired this card. 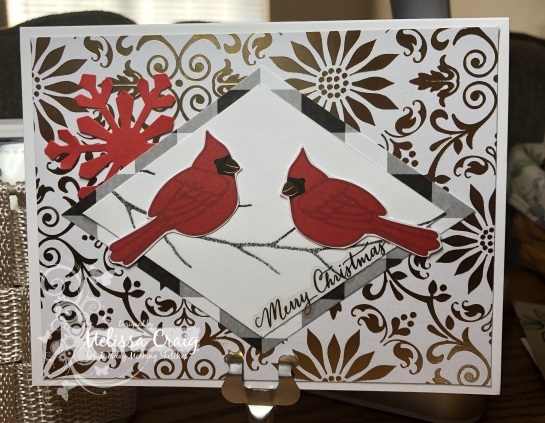 Karin has been attending card club with one of her local CTMH demonstrators lately. She was there a couple of weeks ago and made some pretty cute cards. One of them I thought was great but she hated it. She said it was messed up. And yes, it had a little mistake but it wasn't horrible. Anyway, the card was similar to our sketch this week so I went about making it. My card features stamps, stickers and papers from the July Simon Says Stamp kit. At least I think it was July. The dies I used are from CC Designs. The kit also came with 3 gray card bases so I finally used one. I started with cutting the strips of paper at 1 1/2 inches wide and then adhered to thin white card stock (Recollections). I then lightly tacked that to the base and then ran it through my die cut machine with the circle die. This cut through the first layer just fine. It didn't cut the base but it made enough of an indentation that I could easily put the die back in place and have it match up. I then put the die on the turquoise card stock and lined up a larger die and cut it out. I made 2 frames. Before adhering the decorative paper piece down I put a square of vellum. I stamped the sentiment on the inside with VersaFine Onyx black and heat embossed with clear embossing ink. I finished off the card using up as many of the stickers that came in the kit. I still have some left over. I hope this provides you some inspiration. By the way, my sister loved my card. We'll see you over at the TMS blog. Hello! Thank you for stopping by. Yesterday I decided to pull out some supplies and just make donation cards. 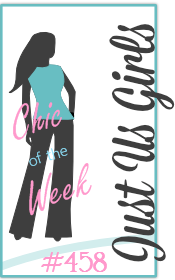 The one card I'm sharing is the challenge from Just Us Girls - this week's challenge is a color challenge. Turquoise, orange and yellow. This is from the... uhh, July Simon Says Stamp kit. I think it was July. Anyway, I hadn't used hardly any of the paper that came in the kit and none of the stickers. So it was time to put them to good use and the colors of the paper just happen to be the colors in the JUGS challenge. This card was easy to put together and will be great for donation. Hi everyone! Thank you for stopping by. The latest sketch is up at Tuesday Morning Sketches and it's pretty plain and simple but holds so many possibilities. My card features paper. Yep not much stamping involved at all. The branch is from the Beautiful Branches stamp set from Concord and 9th. But the rest is from a Christmas Pad paper stack from DCWV. My sister said we were making a project during our Sunday morning FaceTime chat so I pulled out one of my pads of Christmas Paper. I ended up not using it but I did decide to use it for this week's card. The snowflake is from Roasted Red Pepper card stock from Raisin Boat and a large snowflake punch by Martha Stewart. The sentiment is a sticker from Hobby Lobby that I had left over from Christmas cards I made for my Mom. Oh, the black/white paper is also from Hobby Lobby. 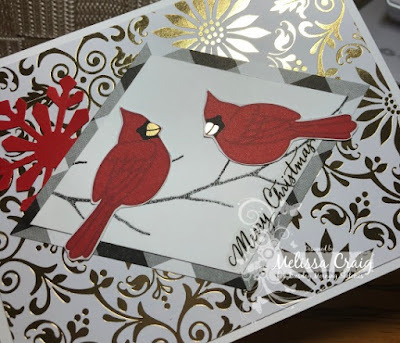 This picture is just so you can see some of the shine from the foil paper and the foiled beaks on the cardinals that I fussy cut from the paper, too. Thanks again for stopping by and we'll see you over at the TMS blog. Hello! Thank you for stopping by. The latest sketch is up on Tuesday Morning Sketches and this one is by Debbie. It screams party - so that's what I made! 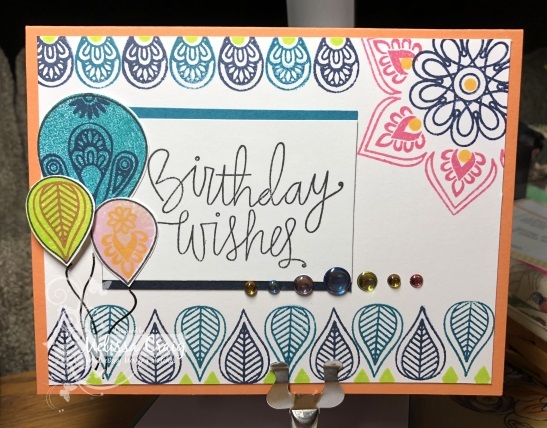 My card features Mandala Maker by Gina K Designs and Birthday Bits by Simon Says Stamp. My neighbor celebrated her 50th birthday over the weekend - this is the card I made for her. Which is why there is some bling on it, it didn't need postage. She had a Mexican theme to her birthday party and nothing says Mexican more than bright colors! Isn't this fun! In this shot you can see the bling bling - so shiny! I used glossy dots by Pink and Main - the rainbow pack. I love these dots and I don't use them a lot because I am all about single postage stamp type cards. Head on over to the TMS blog to join us. Again, I thank you for stopping by and don't forget to visit the design team. We have new faces! Hello! Thank you so much for visiting me today. The latest sketch is up at Tuesday Morning Sketches and I think this one is so pretty. I do think that when I created this one I had a stamp and die set in mind that I later sold. It's okay though, I found something else to play with. 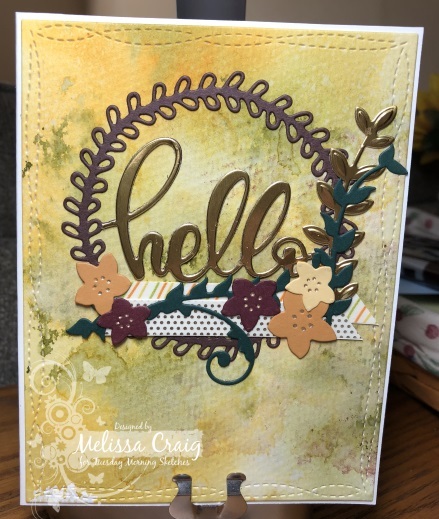 My card features a super fun hello wreath die cut by Momenta found at Hobby Lobby. I also used a couple of Spellbinders dies and Wonky Stitch rectangle by Kat Scrapiness. I tried my hand a watercolor smooshing and I really like this background. My picture doesn't show it very well, but I did die cut the image from gold foil cardstock and snipped out the hello and glued it over top the brown wreath. 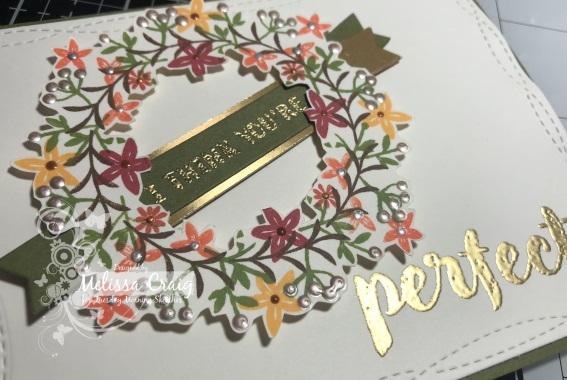 I also covered some cream colored card stock with two different washi tapes and then finished off with some gold dots from a gold gelly roll pen on the flowers. In real life, this card is shiny and so pretty! I really thought my lighting was better than it turned out. Well, we'll see you over at the Tuesday Morning Sketches blog. Be sure to visit each of the team members, too. They deserve your attention. Hello - thank you for stopping by! This week's sketch is up at Tuesday Morning Sketches and I think it's a fun one. I actually don't remember what I was picturing in my head when I drew this one, but I when it came time to sitting down and making a card I had one idea in my head that went in all sorts of directions. My first card ended up in the trash! I played with the Mandala Maker stamp set which turned out fine but when I started adding elements and it just went downhill from there. It went bad to worse! So I my second card first. I'll still show my card that is a bit closer to the sketch. I made this sympathy card to send to my former mother-in-law. Her mother passed away this past Friday. My card features Stippled Flowers by Gina K. I got this stamp set a long time ago and never really did a lot with it. So it was time to pull that out. 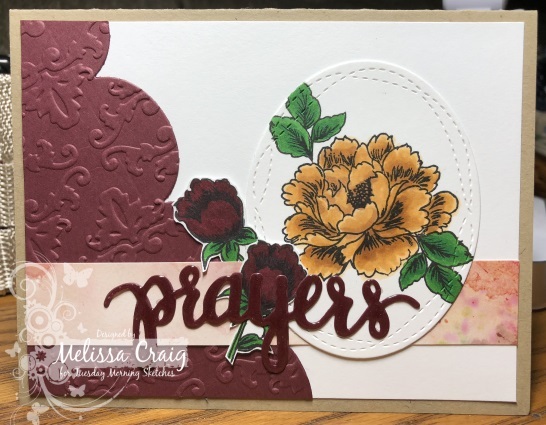 The prayers sentiment is from Simon Says Stamp. I love this autumn color palette I chose to work with. I used these colors with my 1st card and decided since it was all out, I'd continue with it. Here's my 2nd (my 1st actually) card - this one is a looser version of the sketch. 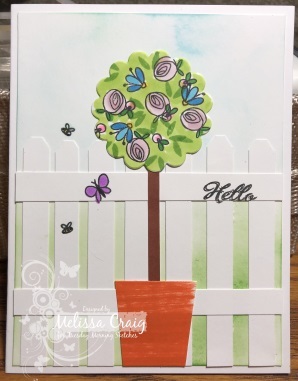 This card features Beautiful Flowers from Simon Says Stamp. Another one I haven't used a whole lot. The sentiment is from Mondo Sakura by Ellen Hutson. The background stamp is from Raisin Boat stamped with Barely Beige ink by SSS. 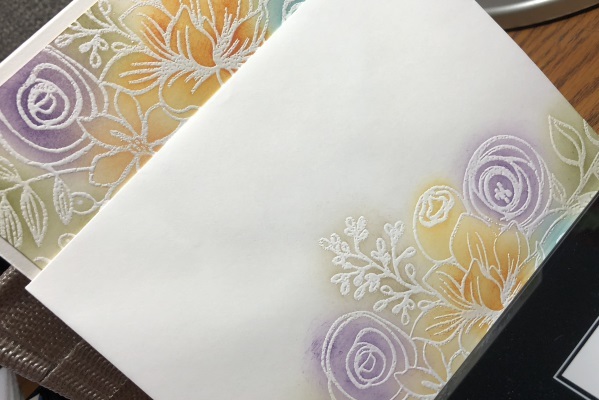 I stamped the floral spray onto card stock and colored with various Copics. I only cut the top part of the image and matched the lower left corner of the card base. I used the Wonky Stitch ovals die from Kat Scrappiness to make the burgundy mat and a stitched oval for the white base. I hope you enjoy my cards and that I will see you over at the TMS blog. Hello! Thank you so much for stopping by. The latest sketch is up at Tuesday Morning Sketches and I love this sketch. It's so much fun. In fact, so much that I made 3 cards. Up first is the card I had in mind. When I designed this sketch, I decided it was time to dust off some very old dies. These dies came with the Cuttlebug when I got it 15 or so years ago. So my first card is a literal version of the sketch. 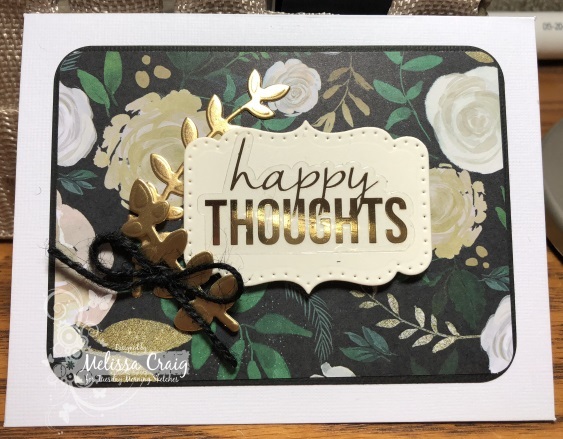 This card also features foil mates from Gina K Design, Smile die and sunshine sentiment from Pink and Main, Wonky Stitch die from Kat Scrappiness and black foil from Heidi Swapp. 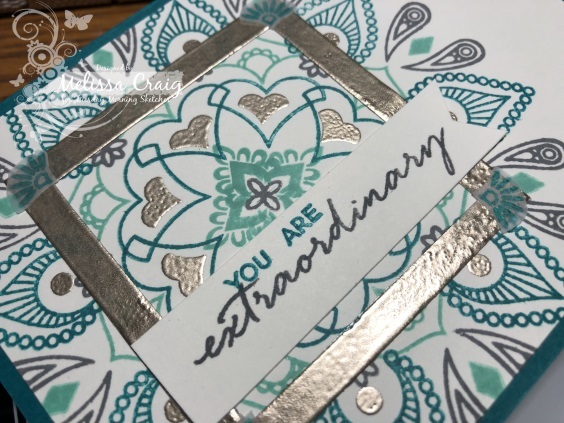 Here's a snippet of the card hoping that caught some of the shininess of the foil and the little bit of sparkle I added with the shimmer pen by Nuvo. 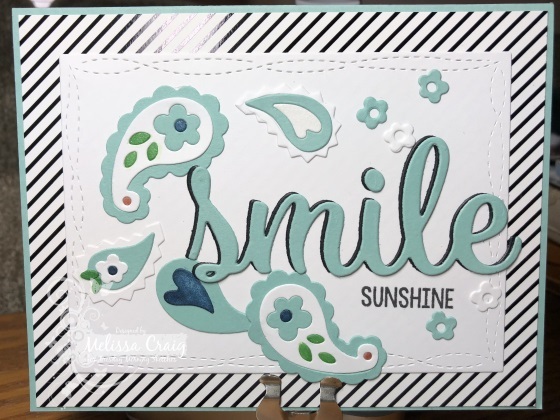 This card features the same die cut pieces and the same smile die from Pink and Main. 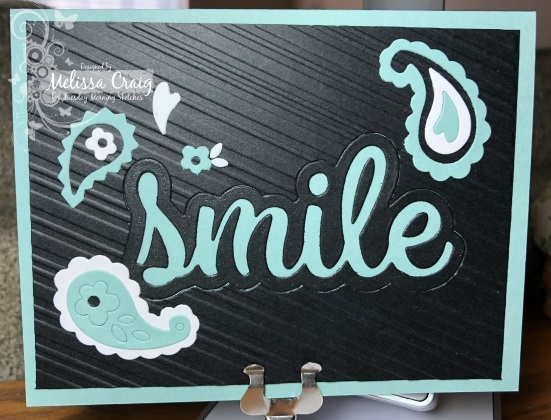 I embossed the black panel with the candy stripes embossing folder by Cuttlebug. Before I adhered the smile background piece to the card base I covered it with the shimmer pen. This picture still doesn't capture all the shine - but trust and believe, in real life it's sooo pretty! 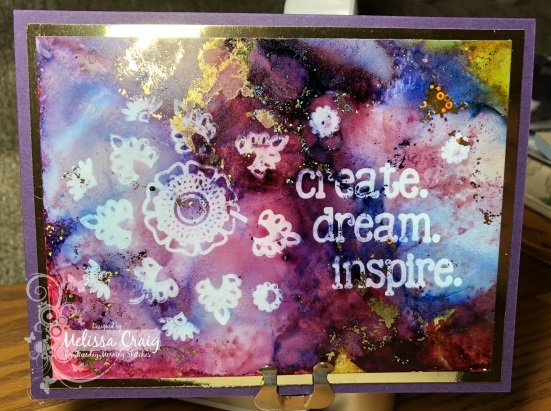 Now for my last card - this one features alcohol inks (yes, I caved and bought 3 more colors), some gold sparkle foil from Gina K that came in the Simon Says Stamp October kit, the Mandala Builder stamp set also from Gina K and Alcohol Lift ink. I think this background turned out so beautiful. My son asked me to make him on a way larger scale. This photo doesn't do it justice. It's just so cool in person! Thanks again for your visit. Head on over to the Tuesday Morning Sketches to join us and to visit the team's blogs. See you there! Hello. Thank you for stopping by. The latest sketch is up at Tuesday Morning Sketches and it's a nice canvas. You will love it - Debbie did a great job. 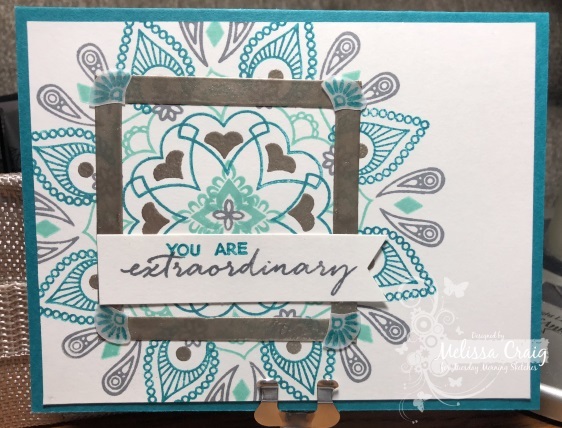 My card features the brand new Gina K Designs Mandala Builder stamp set. I don't usually fall head over hills for new stamps. I tend to ponder them for a little bit. There was no pondering on this one - I bought it immediately. This type of set just makes me think of my daughter and my oldest sister. I used colors by Kelley Purkey and they went together so well. I also embossed a few of the pieces of the mandala with Platinum embossing powder by WOW! I love love LOVE now this turned out. But the mandala was so gorgeous that I couldn't cover it up! So I cut a frame from vellum and also embossed it with Platinum embossing powder. I messed it up a little and it's a little cockeyed but hopefully I masked it well with the placement of the corner elements and bringing the sentiment strip up and over. The sentiment is from Mondo Sakura stamp set by Ellen Hutson. Pretty gorgeous, right!? I love this embossing powder. I want to turn everything platinum! Okay - be sure to visit the team and play along with us at Tuesday Morning Sketches. We'll see you there! Hello. Thank you for stopping. 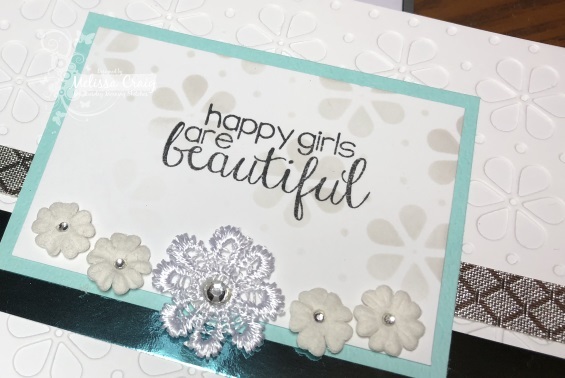 I'm sharing a card today that was a joy to make but the reason behind it is so sad. My dear Aunt Nancy lost her long time companion a few days ago. She and Danny have been together for about 14 years, however, they were friends for a long time before that. His death was very sudden - he was working on my Aunt's car and collapsed. Danny was one of my biggest fans. He loved my cards. He looked forward to every birthday and holiday just to get one of my cards. He was so sweet and complimentary. He also supported my oldest son throughout boot camp because he remembered going through it decades before. He will be missed. 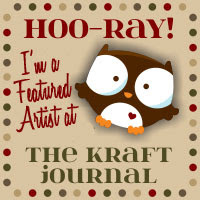 My card features the stamp set that was in the October Simon Says Stamp kit. This set is called Sketched Flowers. This has been a really great kit! This stamp is huge so it covers a lot of surface area. My card is definitely inspired by Kristina Werner's mail art project. I stamped the image with SSS embossing ink that came in September's monthly kit. I heat embossed it with Glacier White embossing powder by Nuvo. I then blended on color using Dusty Concord, Peacock Feathers, Scattered Straw, Dried Marigold, Spiced Marmalade, Frayed Burlap and Forest Moss Distress Inks. I embossed the sentiment, which is also in this set, using gold embossing powder. It didn't turn out well - but it's embossing powder I've had for 20 years. No joke. It went in the trash. And then true inspiration from Kristina's project, I made a matching envelope. I hope it brings comfort to my Aunt. I am submitting this the Just Us Girls challenge this week - which is to make Sympathy cards. I hated that I had a reason. Hello! Thank you for stopping by. I appreciate your visit. The sketch is up at Tuesday Morning Sketches - I think you're gonna like it. I am not even a fan of orange but I love this! The focal point of my card was made with 2 of the colors of alcohol ink that came in the kit - yellow and orange. I tried to blend it with rubbing alcohol but I wasn't getting the results I wanted. So off I went to Michaels with a 50% coupon for blending solution. That looks like fire! It's soooo cool. The kit also came with Lift Off ink which is what I used to stamp the image over the alcohol ink. I also used the leaf stamp to make my base layer. My diamond pieces are from Gina K foil mates and I foiled them with two of the colors of foil that came in the kit. My card elements covered the whole card which is the sketch blown up but I am still super happy with how this turned out. Have a great day and we'll see you over at the TMS blog! Hello! Thank you for stopping by. The latest sketch is up at Tuesday Morning Sketches and this one is inspired by Carol. It's a lovely sketch with so much possibility. 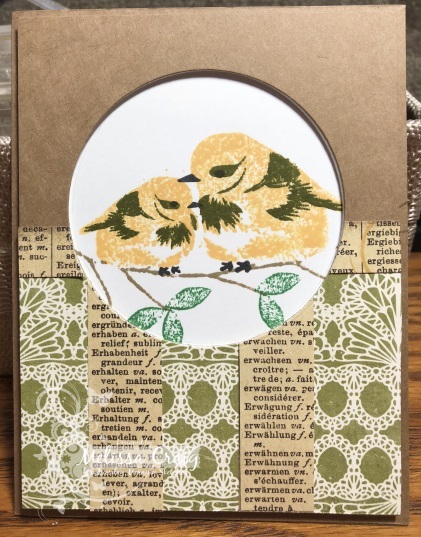 My card features stamps from WPlus9 and the Wreath template from GinaK. The ink colors are Kelly Purkey colors - these are so pretty. I do wish they had names. I just discovered a company that I'm not sure I'd ever heard of them. I'm still not sure if they have exclusive stamps and dies and sell other companies, too, or what. But they had the best prices I've ever seen on layer dies. I've been wanting some wonky stitches dies and I've only seen them by MFT and they're like $30. But this company, Kat Scrappiness, has them for $12.99! I bought two sets (rectangles and ovals) for less than one set at MFT. Anyway - enough of the commercial. 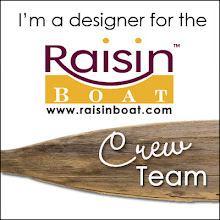 I'm not an affiliate of Kat Scrappiness and I'm not on the design team. I was just impressed. I made the wreath with some flowers and foliage images in the set. Then I finished it off with 3 different colors of Nuvo Drops. Before adding the drops, I did fussy cut the wreath out. Then I cut two strips of Jelly Bean green card stock and one strip of gold foil card stock from a banner die by MFT stamps. I embossed the sentiment with gold embossing powder. I need detail gold powder, this came out a little too grainy. I cut the base panel from Natural White card stock (Neenah) using the largest wonky stitched die. One thing I messed up on, I ran it through my Gemini electric die cutter but I really needed to remove a shim because there was too much pressure that it made the cut warp a bit. But overall - I love this card. I think it turned out lovely. I hope you like this card and I hope it inspires you to join our challenge. We'll see you over at the blog. Hello! Thank you for stopping by. The sketch is up at Tuesday Morning Sketches and it's a fun one. It's by Debbie and I know you're going to love it. I actually made two cards. 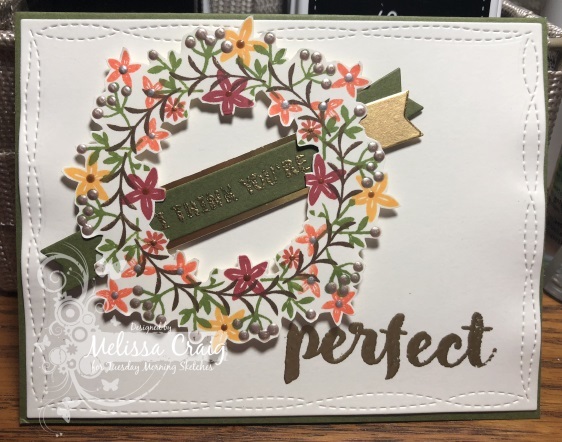 This first card features dies from Spellbinders, a sentiment from the Wreath Builder set by Gina K and paper from DCWV. I thought I liked this card but the more I look at it, the more I don't. The flowers just look weird. I was really trying to go for an almost near Fall card and it's awful. So sorry. This next card is a loose interpretation of the sketch and I like it much better, sort of. 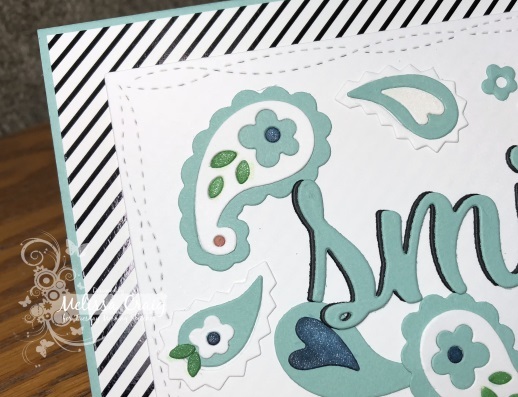 It features and Stamp & Emboss folder from Spellbinders called Rose Flourish. The sentiment stamps came from this great set called That is All from WPlus9. I had a lot of fun with this one. Seems alcohol inks are becoming trendy again. I never jumped on that band-wagon. But the October Simon Says Stamp kit has 3 bottles of alcohol ink so it got me to thinking. Am I going to give them away or give them a try. I wasn't about to run right out and buy more to give them a try - I mean why? I have refills for many of my Copics. That's alcohol ink! So I cut a little piece of felt and added some color to it and brushed it across some vellum. I liked this. And then I added some splatters of rubbing alcohol and thought that looked pretty cool. So I didn't want to lose those neat looking drops so I cut the panel down and layered the vellum piece behind it. I also think it looks really cool behind those leaves - gives so much interest. What I didn't like is I didn't have much room for a sentiment to begin with, but cutting down the panel really made it challenging. The sentiment looks squeezed in - but hey, it is what it is. The little hearts came in the set, too. I am really loving WPlus9 stamps. I think I need to drive to Jacksonville to meet Dawn. It's only a few hours away. I guess I'll have to email her sometime. I hope you like the cards and that'll you join us over at Tuesday Morning Sketches for this challenge. Please be sure to visit the design team blogs, too. They deserve your kind words. I did enjoy my weekend. I worked on some projects so that was fun. I also decided I needed to play along with a couple of challenges. I'm pretty sure I'll never get noticed at MFT Stamps, but I liked their sketch and thought that I might as well give it a try. I'm also playing along with Just Us Girls - I haven't joined one their challenges in a really long time. So it was high time. 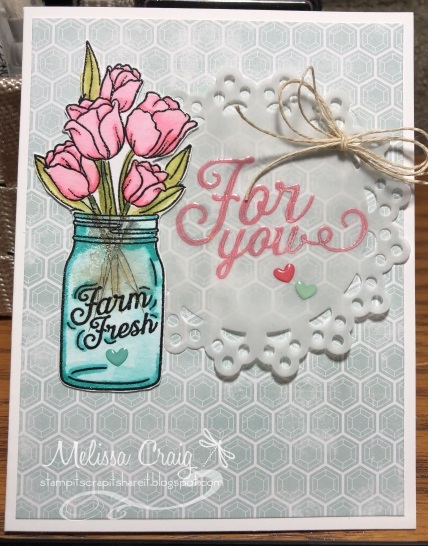 My card features the Build a Bouquet stamp set by MFT - I'm pretty sure the stamps and dies are retired. JUGs challenge is a color one - coral, gray and one other color. 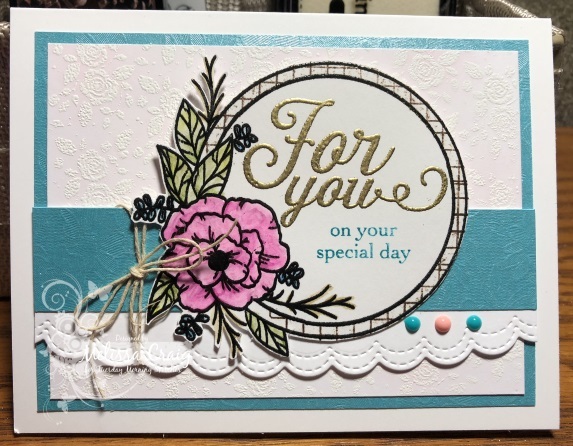 I absolutely loved Francine's, MFT DT, card so this one I tried to emulate with a stamp set that I have and my own touches. I watercolored the flowers using Zig marker on the leaves and and Abandoned Coral Distress Oxide ink for the blossoms. I blended on Hickory Smoke Distress Oxide ink on the card base then did some splatters with the same ink and dark gray Zig marker. Thanks for stopping by, I would love for you to leave me a comment. Have a good rest of your Sunday night. Hello! Thank you for stopping by. The latest sketch is up at Tuesday Morning Sketches and it's a really fun one. There's also a really fun prize up for grabs, too. You'll have to go over to the challenge blog though to see what it is! My card this week features the August Small Die from Spellbinders. This is a fun set - some cute little birds and viney leaves and the most adorable little flower. I'll be playing with this one for a little while - I am skipping September. I didn't like the Halloween theme with little ghosts and stuff. I really like dies to be a bit more year-round functional. The paper I used came in the Simon Says August kit. I just loved it and wanted to make sure it got enough surface action. I took a strip of black card stock and I actually meant to emboss that before adhering to the paper but I forgot, so I did dots of white Nuvo drops instead. I think I'd still prefer it to be embossed but it is what is. 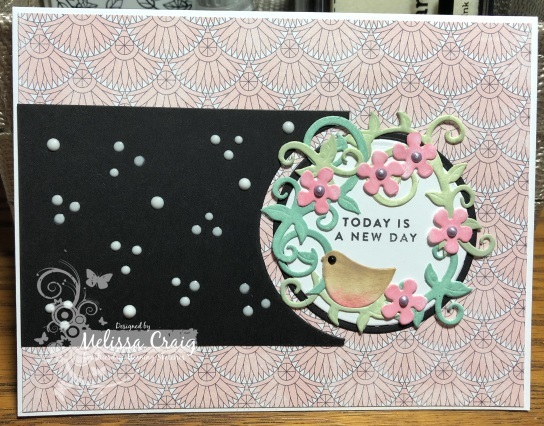 I just the vines, flowers and bird out of white card stock and then used Oxide inks to color them. I am really loving the little blenders I picked up. Made coloring the bird and flowers so easy! My card is a simple notecard and is already off to one of my favorite young lady who is going through a rough patch but she is strong - she will come through it well and wiser. Please head on over to the blog to join us. Be sure to visit the design team blogs, too. They'd love to hear from you. 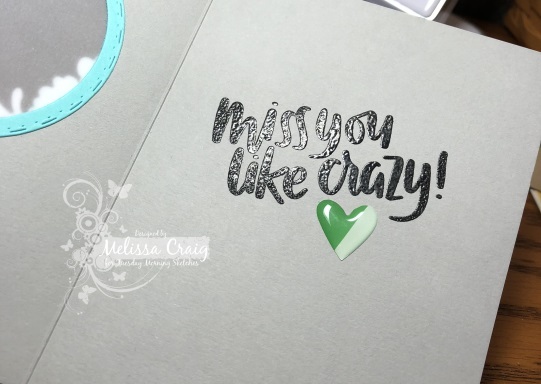 So yesterday I mentioned that I was playing with the Simon Says Stamp August kit - finally. After making my TMS card, I just kept going. None of these are originals - they were inspirations from Pinterest. I don't know the original artists, although Tina Smith from Cards And Coffee is one of them. She's very talented, just not very good about answering her email. This first card I saw on Pinterest. The original artist used a circle piece of card stock and stamped the sentiment. Then added a bow with a paperclip. I just wish it wasn't so rainy here so that the colors on my card are a little more true in the photo. This is really lovely in real life. I cut a piece of vellum using an old doily die from MFT. I stamped the sentiment using Worn Lipstick Distress Oxide ink and because it was vellum it stayed wet long enough for me to add clear embossing powder. 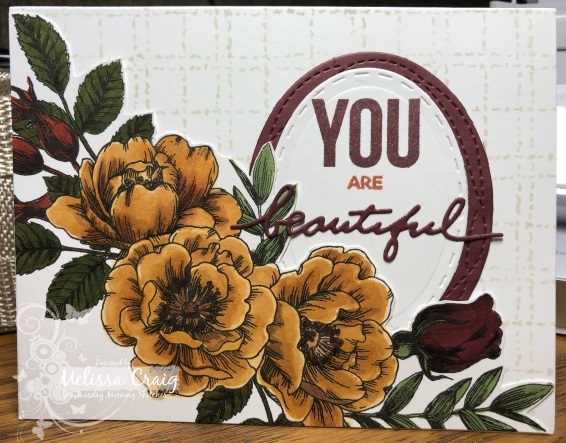 The floral image was stamped on Ranger watercolor paper and colored with Zig Real Brush markers. I tried to put stems in the jar but sort of made a mess. I still like the overall card. This next card was inspired by Tina Smith. Mine didn't come out as good as hers, but I still like it. 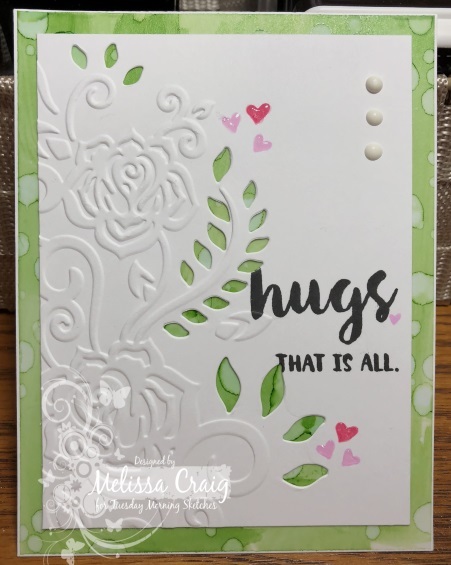 This one I stamped the background flower stamp using Fog ink. This card was also inspired from Pinterest. It's not exactly like the photo on Pinterest. I did the sentiment strips a little differently. I like how this turned out. These were a lot of fun to create and I hope that whoever receives them in my donation box will enjoy them, too. Hello! Thank you for stopping by. I appreciate your visit and I hope that you leave me a few words so let me know you were here. The latest sketch is up at Tuesday Morning Sketches and it's a fun one - a little tricky but not too bad. My card features stamps and papers from the August Simon Says Stamp kit. I finally got to play with and didn't stop. I'm sharing more cards that I made with stamp set tomorrow. Instead of a square, I went with the circular floral image. I stamped it with VersaFine Black Onyx ink and heat embossed with clear embossing powder. I colored the image using Spectrum Noir Colorista Aqua pencils. I have to say, I'm glad I got these on clearance because I'm not sure I like them very much. The white panel I white heat embossed the background stamp that came in the kit and then lightly brushed on Spun Sugar Distress Oxide ink. And I do mean lightly. You can barely see the pink. The turquoise paper came in the kit. Oh, and I did mask off the image so that I can stamp that bit of pattern into the ring part of the frame. I used a new to me ink by Kelly Purkey. Unfortunately, the ink cubes don't tell what the color names are. 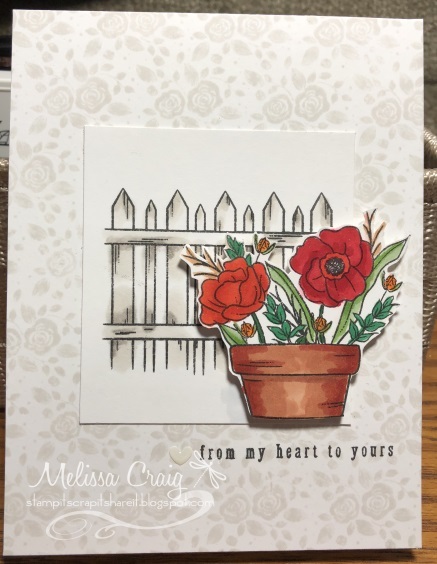 My scalloped border is a die from Simon Says Stamp. I finished it off with some drops of Nuvo Drops - Bubblegum Pink which came in the kit and Caribbean Ocean. Look at that shine on the embossing! So beautiful! The gold embossing power is by Stampendous, the white panel was embossed with Glacier White by Nuvo and I have no idea what brand my clear embossing powder is. I hope you like the card and that'll you join us over at Tuesday Morning Sketches for this challenge. Please be sure to visit the design team blogs, too. They deserve your kind words. Hello! Thank you for stopping by. The sketch is up at Tuesday Morning Sketches and it's a nice one. I love the layers and little bits. The September Simon Says Stamp kit arrived in the mail on Friday and I was so excited to get to play with it over the weekend. It's pretty bad though, I still haven't played with August's kit! Ack! I am hoping to get some time this upcoming holiday weekend to play with all the goodies I haven't played with yet. Look at that gorgeous paper that came in the kit! Oh my goodness! It doesn't die cut very well, but I forgive it for giving me such a hard time because that finish is just too pretty. So it appears that unicorns and mermaids and the latest trend. Every stamp company has come out with their own. And honestly, I haven't like any of them because they are way too cutesy and cartoon-y. So not my style. This set is more on the side of artsy and pretty. As of this posting, the kit is still available for purchase. I enjoyed coloring this one up. I stamped on the Bristol Smooth card stock. I colored with the Zig clean color real brush markers. I only used water to blend the tail a bit. The background was colored by blending on Tumbled Glass and Stormy Sky Distress Oxide inks. I also blended on some Faded Jeans but then I ended up covering it up. There is a coordinating die set that can be reserved, but $40 is a bit too much for me. These images were not difficult to fussy cut. I added some Nuvo Crystal drops to the bubbles to give it some shine and dimension. I made the sentiment using Nuvo White embossing powder - I really need detail white. It's in my SSS cart. You all know how much I love decorating envelopes. I made this one. The gray of the card base and the gray of the envelope don't exactly match, but that's okay. I love how this envelope came out. If I space the address correctly, the zip code will fit between the angle fish and the starfish. Hello! Thank you for stopping by. I am so glad you're here - please leave me a comment to tell me you were. The latest sketch is up at Tuesday Morning Sketches and it's another easy one - one that is pretty similar to last week's. My card features Mondo Sakura from Essentials by Ellen, Need for Tweed background stamp from Raisin Boat and border and sentiment stamps from Choose Joy set from Simon Says Stamp. The inks I used is Spun Sugar Distress Oxide ink and VersaFine Oynx black ink. I used Neenah Classic Crest solar white card stock. My idea for this card was definitely inspired by Jennifer McGuire's video she posted a couple of days ago. I liked this idea and I really wanted to give it a try with what supplies I have here. The only thing I don't like about my card is how the coloring turned out on the flowers. Note to self - tip to you: Zig Real Brush clean color marks do not color well on Neenah card stock! Use the Bristol Smooth! It's blotchy and it doesn't blend well. But my sister thought the card looked pretty so I went with it. 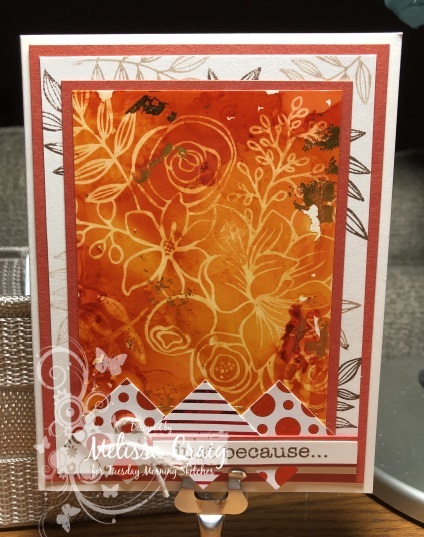 This is essentially a one layer card - a lot of masking and double stamping using the MISTI. Hello! Thank your for stopping by. Our latest sketch is up at Tuesday Morning Sketches and it's a really easy one. I think you're going to like it. 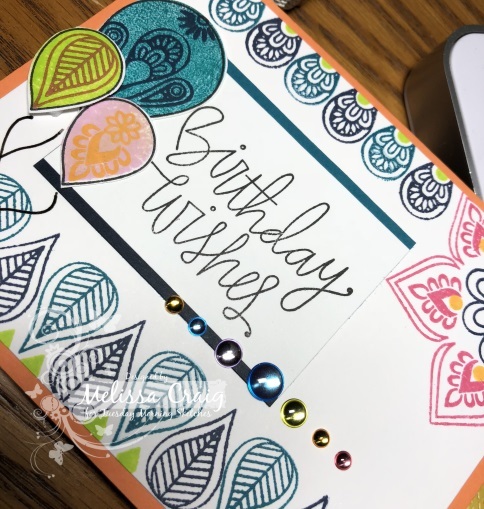 My card features papers, stickers and dies from a past card kit that I purchased when Spellbinders had a too good to pass up sale. This was, if memory serves, is September 2017. I haven't had a chance to play with it until this past week. I had off 5 days and although I had super high expectations to get a lot of crafting done - I didn't. But I still enjoyed the time off. It was needed. This card was super easy to put together. I used the card base that came in the kit as well as the decorative paper and black card stock. Spellbinders card kits are really cool - they send paper, embellishments, card stock, ephemera, ribbons/fibers and of course, dies. There are 11 dies in this kit. I cut two leaves from the gold foil card stock and one label from white card stock. This kit also has these cool sentiments that are gold on clear plastic. This card went together in about 10-12 minutes. In this view you see how pretty and shiny the gold paper is. I finished this off with some black twine that I made a little bow from and adhered using Ranger Multi-Medium Matte. This is really strong glue and dries to a matte finish so it's virtually invisible. I hope you like my card and you're inspired to join us. Be sure to visit the design team, too. They created some beauties to share with you. Hello! Happy Sunday. 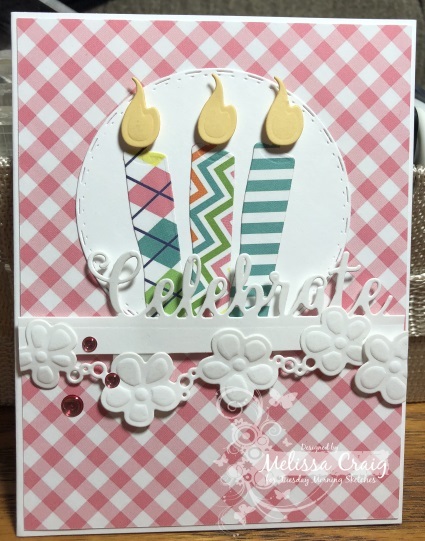 I made a card to share with you using Pink and Main products. I am not on their design team, I am just a huge fan of Michelle and her store. I picked up these products a few months ago when I was helping out at the Pink and Main booth at StampFest. This is just my first chance to play with them. I've been off for the last few days and although I had intended my 5 day weekend to be more productive than it turned out I am feeling refreshed and ready for my busy season to kick off tomorrow morning. Isn't it pretty! I love how this card turned out. I made a video of my process. You can find it below. 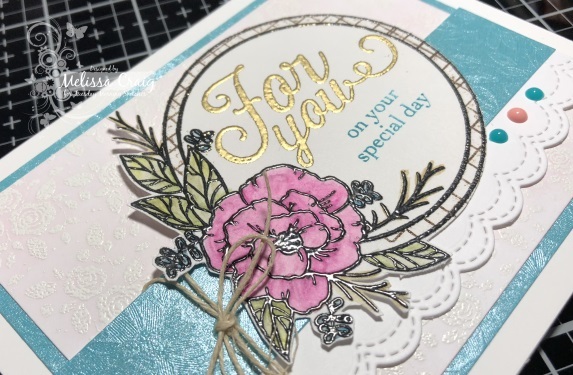 I used Distress Oxide inks to color the card base. I don't do a lot of rainbows and after seeing this I don't understand why I don't! This card makes me so very happy!! 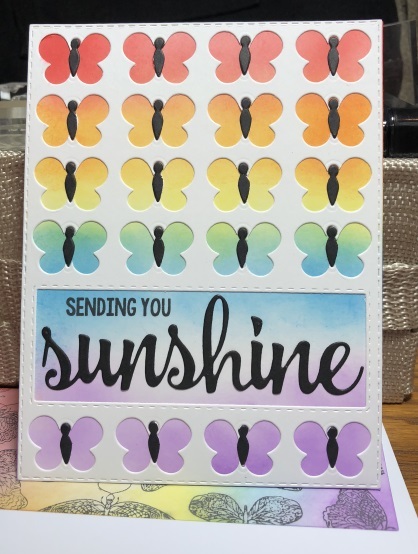 I am loving how the sentiment window, even though I intended that section to be whiter, has this halo look behind the *sunshine* die cut word. Please check out my video. If you liked, please give me a thumbs up and if you're so inclined, please subscribe to my You Tube channel. Hello! Thank you for stopping by. The latest sketch is up at Tuesday Morning Sketches and it's a fairly clean and simple one but you can certainly jazz it up, too. 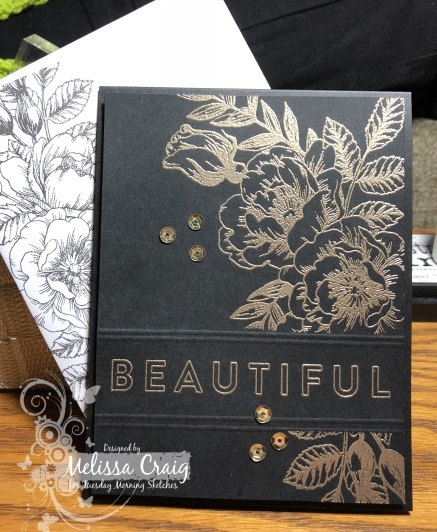 My card features Beautiful Flowers stamp set by Simon Says Stamp, black card stock from Ellen Hutson and Metallic Platinum embossing powder by Wow! 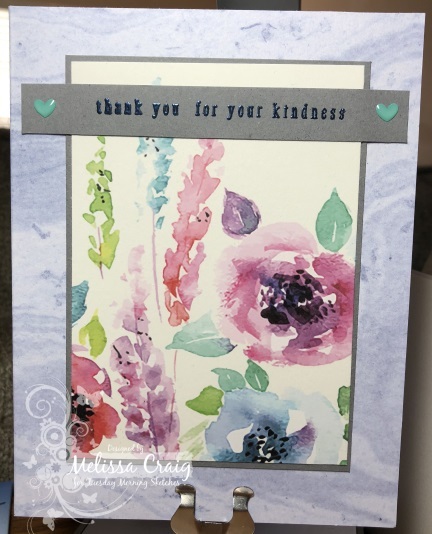 When I started this card, this original intention was to create a card like the one Jennifer McGuire made. 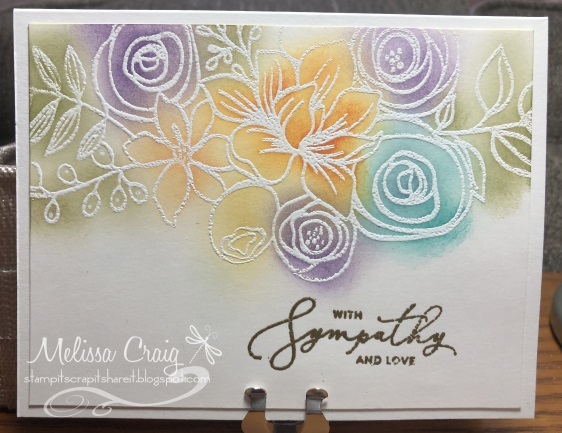 She used the same stamp and watercolored with Distress Oxide inks. 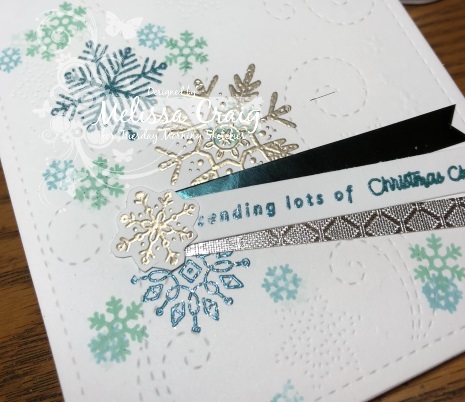 But I did the heat embossing and thought the card was stunning just like that - I didn't have the heart to add to it. I did emboss some double lines using my Scor-Buddy for my sentiment area. I then stamped a white panel with the same stamp in black ink for the inside (not pictured) and the back flap of an envelope. I added a few gold sequins after I mounted the stamped panel onto a top folding card base. I used black fun foam to add some dimension. 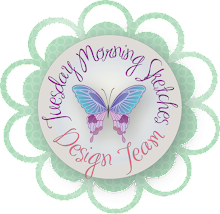 I hope to see you at the Tuesday Morning Sketches blog and can't wait to see your card! Also, please visit the design team. Hello! Thank you for your visit. The latest sketch is up at Tuesday Morning Sketches and I think you'll like it. I had a lot of making my card - my son's girlfriend said this one belonged in a store! Cool compliment. So my card features a Mama Elephant stamp set designed for Hampton Arts. I picked this up at JoAnn's and this is the prize, too! 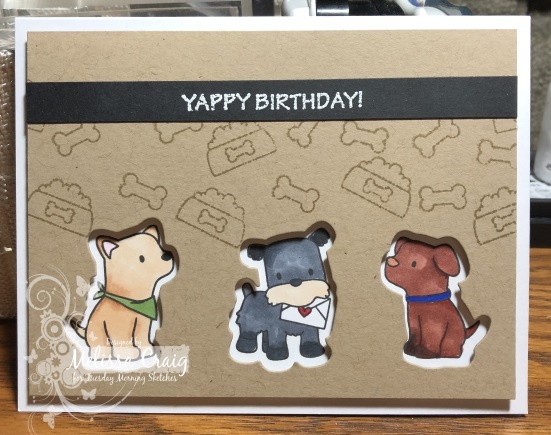 This card is perfect for a dog lover's birthday! Yappy Birthday - cracks me up! The doggie in the middle, I know is a terrier, but it reminds me of my little dog Charlie. He's shih tzu. Hello! Thank you for stopping by. The latest sketch is up at Tuesday Morning Sketches and it's a super easy one. 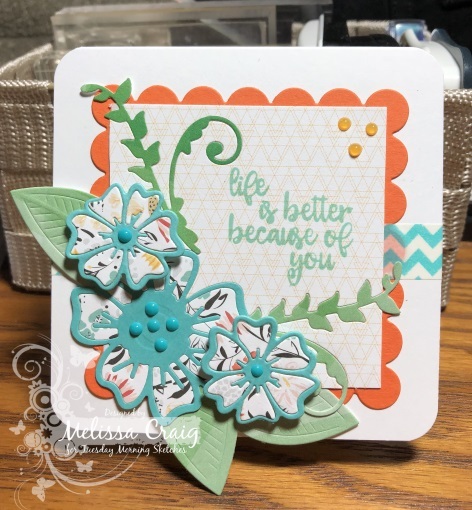 My card features the July Small Die of the Month from Spellbinders. If you've considered this subscription and haven't done it I strongly urge you to because it's awesome. It's a great value and I am so happy I signed up. No video on this card but I'm almost wishing I had. 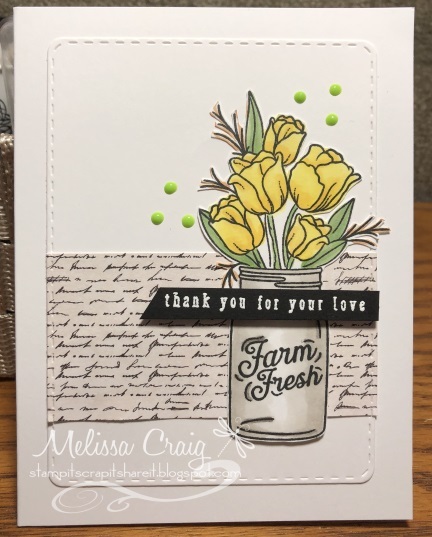 The card stock and papers is from the May 2018 Simon Says Stamp card kit. The sentiment is from the Wreath Builder set by Gina K Designs. This was my first ever attempt at inlaid die and I have to admit - it was a ton of fun because it reminded me how much I love puzzles. I embellished with Nuvo Crystal Drops Caribbean Ocean and Nuvo Jewel Drops Orange Marmalade. Hello! Thank you for stopping by. The latest sketch is up at Tuesday Morning Sketches and I hope you love it as much as I do. My mind went in so many directions with this sketch. So I decided to make 3 cards with one sketch! Be sure to scroll down to see the video. My first card features Brushed Birds by Papertrey Ink, Beautiful Branches by Concord and 9th, a die that I picked up on clearance at CC Designs and I stamped with Distress Inks. My sister already claimed this card! I did turn out rather pretty if I say so myself. This next card features the Small Die of the Month (July) from Spellbinders - this one also has a cupcake in the set but I'm not sure I like it so well. 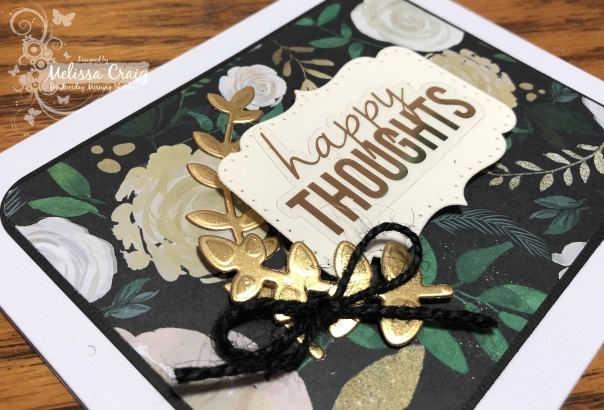 The sentiment is also from Spellbinders Small Die of the Month (June). The papers that I used are from Pink and Main and the circle die is from CC Designs. 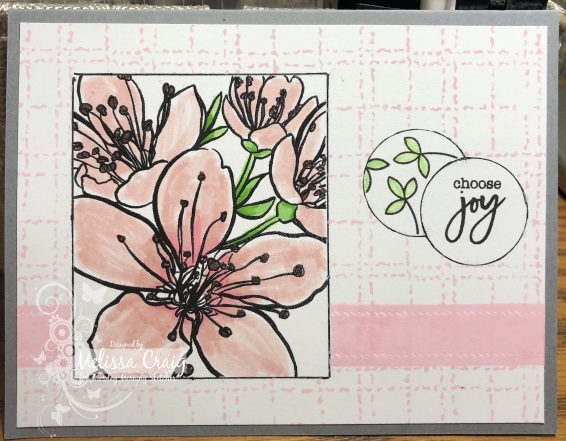 And my 3rd card features Bitty Blossoms by Sweet n Sassy, scallop die from Pink and Main and inks from Papertrey Ink as well as some various Copics. The sentiment is from Hero Arts. And here's the video. This one turned out better but it's long. So I need to get lessons on how to edit my video and then speed it up. That way I can show you the process without taking up so much time!